I’m baaaaaack! I’ve been gone for a few weeks (did you miss me? ), putting the finishing touches to a special project that has taken me about 2 years to finish up. I can’t even begin to tell you how excited I am to share it with you all very soon. I can’t just yet though, but when the time comes, it’ll be amazing. You’ll cry, and then I’ll cry, and then we’ll all cry together some more. It’ll be magical. Everything I’ve ever dreamed of. I have been so busy focusing on this project, that I haven’t had much time for updating the site. I’m sorry about that. It’s been a long and painful 2 weeks without a new full recipe, and without creating a weekly distraction for you, believe me it pained me. I’ve missed it so much. Last week I did share a Croissant, Ham and Cheese Stuffing, just in case you didn’t catch it, but that was a shortened post so it doesn’t really count. It’s a great Thanksgiving stuffing if you’re in the market for one. Anyhow, now I’m back and I’m bringing you this irresistible dessert and/or breakfast that is perfect for the season. Did I mention how excited I am to be back? I’m always so busy running around the days leading up to Thanksgiving, and especially super busy on the actual day, that I most often than not forget about making breakfast. Does that happen to you, or is it just me? It’s funny because I plan everything out for the big meal and I have it all mapped out meticulously, but for some reason year after year, I forget about making something for breakfast. By the time I remember, I’m knee deep in holiday cooking and my family is coming in and out of the kitchen asking if they can try something, anything. This year, however, I didn’t want to be unprepared. This year I waned to make sure to have something delicious and homemade ready to go for breakfast. 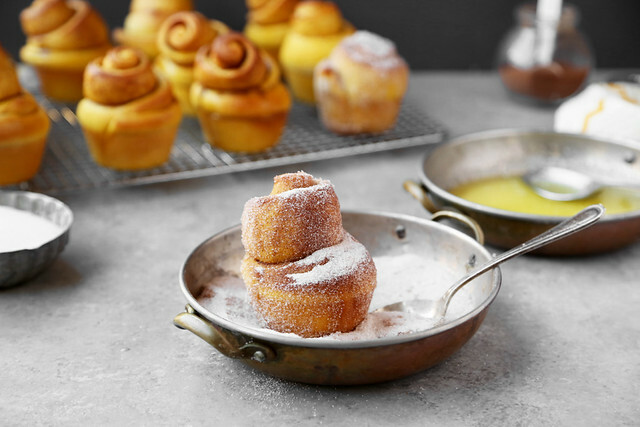 These Pumpkin Sugar Buns are everything a sugar bun should be; soft, flavorful and easy to whip up. 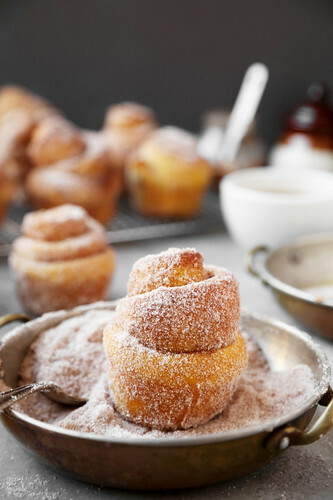 If you can make and bake cinnamon rolls, you can definitely make these sugar buns with your eyes closed. The best part is that you can bake them the night before and then finish assembling them in the morning, right before you start cooking that turkey and making those sides. 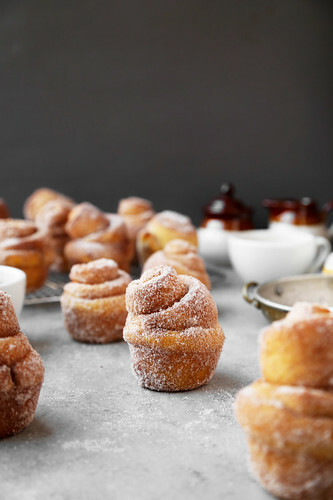 I like these sugar buns because they’re a bit more flavorful than regular sugar buns, thanks to the pumpkin and cinnamon. I’m all about cinnamon rolls with lots of cream cheese frosting, but sometimes we all just need a roll covered in cinnamon sugar, especially during the holidays. P.S. They’re not just for breakfast! They happen to make a great dessert as well. Bring them to your Friendsgiving party instead of pumpkin pie. Trust me, everyone will thank you for it. This is a basic yeast dough turned basic pumpkin yeast dough which you can use for many of your baked pumpkin goods this holiday season. 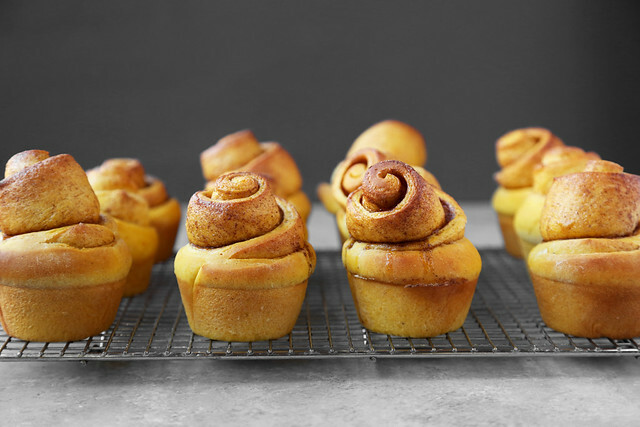 Turn them into cinnamon rolls, sticky buns, dinner rolls or pumpkin cinnamon swirl bread. It’s my go to east dough, and when I don’t want that pumpkin flavor, I just omit the pumpkin purée and reduce the flour by 1 cup. Start by warming the milk, butter and sugar in a small bowl until dissolved. Set aside. Then in a small bowl, combine the warm water with the yeast. Let rest until in a warm spot until foamy and frothy, about 10 minutes. 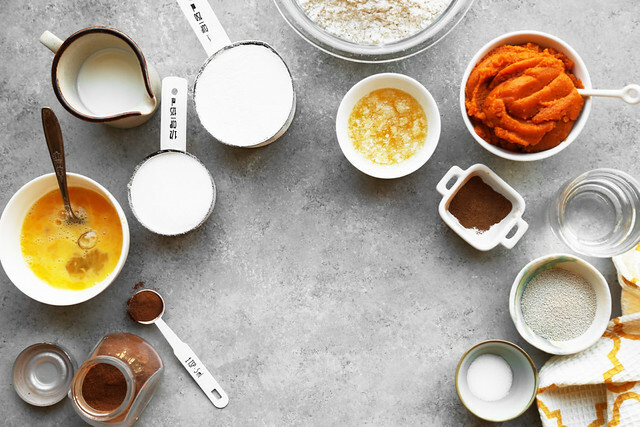 In the bowl of your mixing bowl (a stand mixer is your best friend here, although by hand is totally doable), combine the milk mixture, water/yeast mixture, eggs, pumpkin purée, salt, pumpkin pie spice and half of the flour until evenly combined. 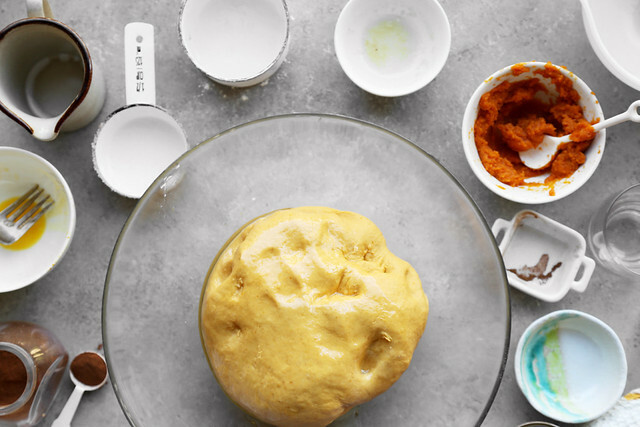 Add as much of the remaining flour as needed to create a smooth and somewhat sticky dough. Knead on high (using the dough hook) until soft and elastic. It should feel like a soft fluffy pillow. A pillow you’d want to sleep on all night long. Transfer to a well oiled bowl, cover loosely with plastic wrap and a damp kitchen towel. Set in a warm spot until doubled in size, about 2 hours. Punch the dough down and then transfer to a lightly floured work surface. Cut in half and then working with one half of dough at a time, roll out into a large rectangle 1/4-inch thick. Brush with melted butte and then sprinkle with cinnamon sugar. Roll into a tight log, lengthwise, and then cut into 12 even pieces. Place them in a well-greased muffin tin. Repeat with the second half of the dough. Cover loosely with plastic wrap and let rest in a warm spot until doubled in size, about 1 hour. Bake until golden brown and super high so that they can touch the sky. Let them touch the sky. 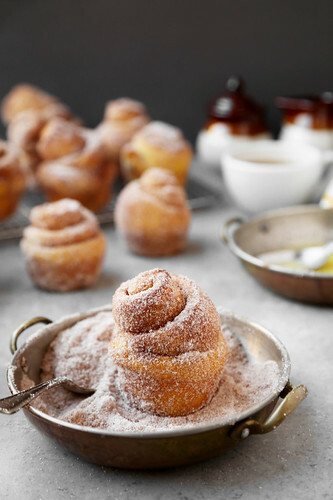 Once the buns have cooled completely, dip them completely in melted butter and then roll them around in cinnamon sugar. You want to make sure they’re totally coated in sugar. That’s why they’re called cinnamon sugar. If you’re not planning on eating all of them right away (although, how could you not?) then I recommend only coating those you plan on eating. Cover the rolls and then coat as you go. 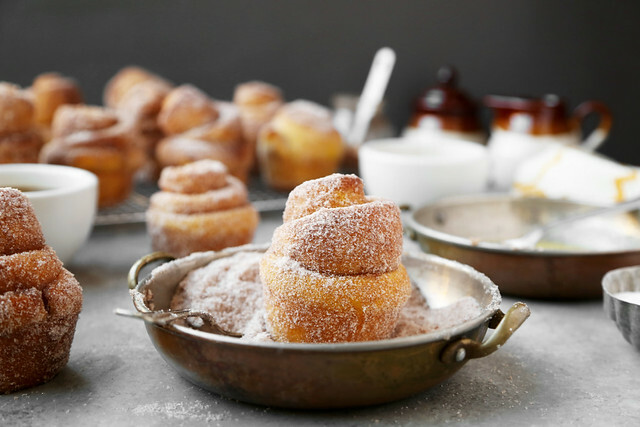 It’s the best way to go around it for the freshest sugar buns possible. If you really want to plan ahead, you can bake off the rolls, place them in a freezer-safe food storage bag and then pop them into the freezer. Keep them in there until you plan on serving them. Just thaw in the fridge the night before and let sit at room temperature for a few hours. Right before serving, dip them in butter and roll around in cinnamon sugar. I love these rolls for breakfast, brunch, or even as a late night dessert after dinner. They’re sweet because of the sugar coating but with the right amount of spice from the cinnamon and pumpkin pie spice in the dough. The pumpkin gives them that perfect autumn taste. So if you’re looking for something new to make this pumpkin season, then look no further. 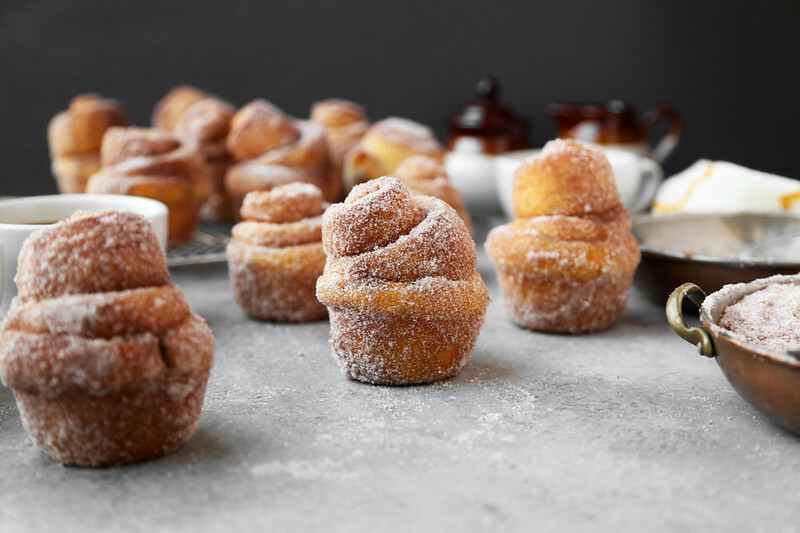 These sugar buns are for you. A few years ago I worked at a bakery, decorating cakes and cheesecakes, and the bakery made (well still makes) sugar buns as big as my head. I kid you not, as big as my head. I always remember them and so I wanted to make sugar buns for myself. These aren’t as big (although they are tall), but they taste just as good. I promise. Give them a try, you’ll become addicted. 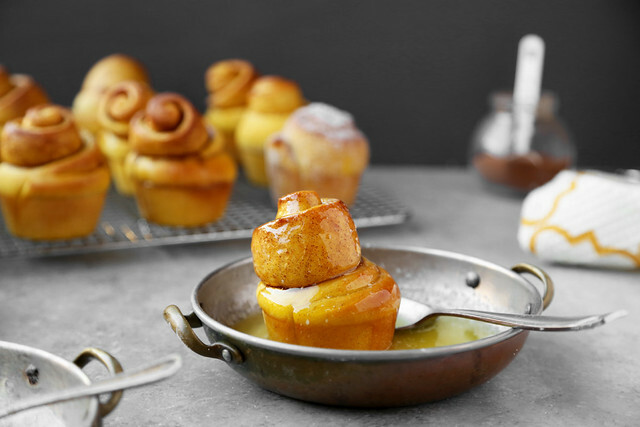 These soft Pumpkin Sugar Buns are perfect as a dessert or for brunch. 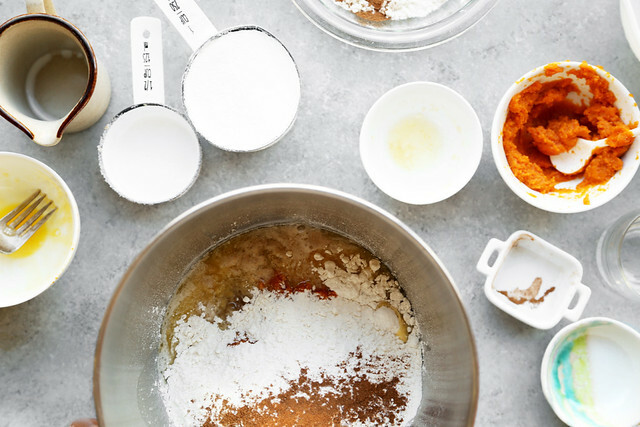 You can make the dough the night before and then shape and bake off the next day. 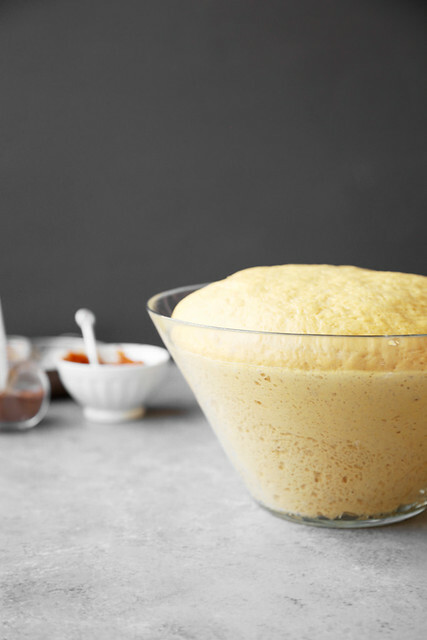 Dissolve the water and yeast in a medium bowl. Let rest in a warm spot until frothy and foamy, about 10 minutes. Warm the milk, butter and sugar in a small saucepan until the sugar has dissolves. Set aside to slightly cool. 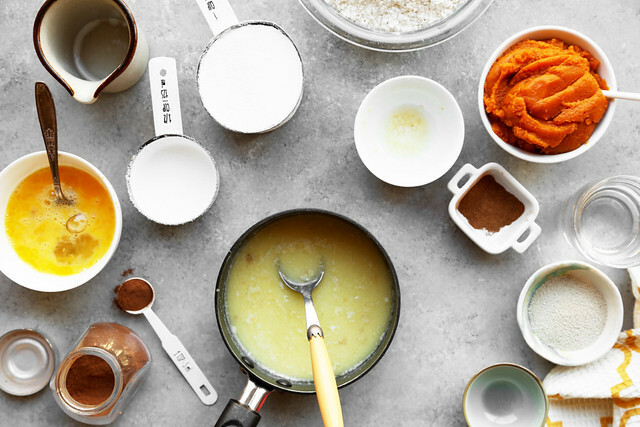 In a large bowl, stir together the milk mixture, salt, pumpkin purée, eggs and water/yeast mixture until evenly combined. 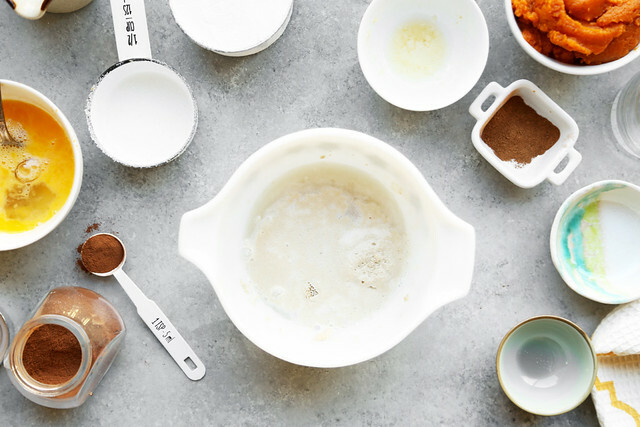 Add the pumpkin pie spice and half of the flour in batches, mixing until well incorporated. Add as much of the remaining flour as needed to form a smooth and somewhat sticky dough. It should pull away from the sides of the bowl while mixing. Knead on high for about 8 to 10 minutes to create a soft dough. Transfer to a well oiled bowl, cover loosely with plastic wrap and a damp kitchen towel. Set in warm spot and allow the dough to rest until doubled in size, about 2 hours. To make the filling, in a small bowl, stir together the sugar and cinnamon. Punch the dough down and transfer to a lightly floured work surface. Cut in half and then roll out each half into a large rectangle, about ¼ of an inch thick. Brush with half of the melted butter and sprinkle with half of the sugar mixture. Roll into a tight log, lengthwise. Cut into 12 even pieces and place in a well oiled muffin tin. 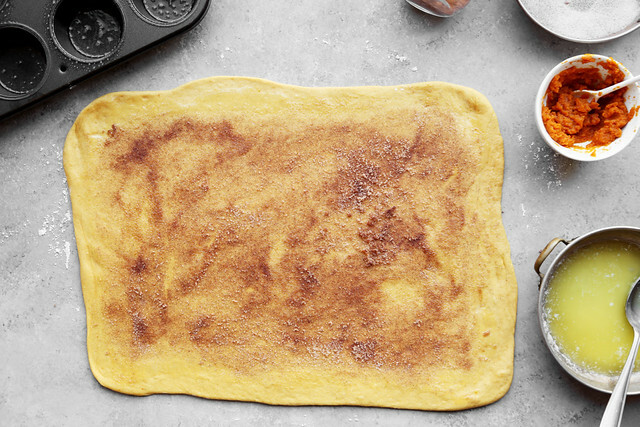 Repeat with the second half of dough. Cover both muffin tins with plastic wrap and let rest in a warm spot until doubled in size, about 1 hour. Meanwhile, preheat oven to 350 degrees F. Bake the sugar buns until golden brown and puffed up, about 20 to 25 minutes. 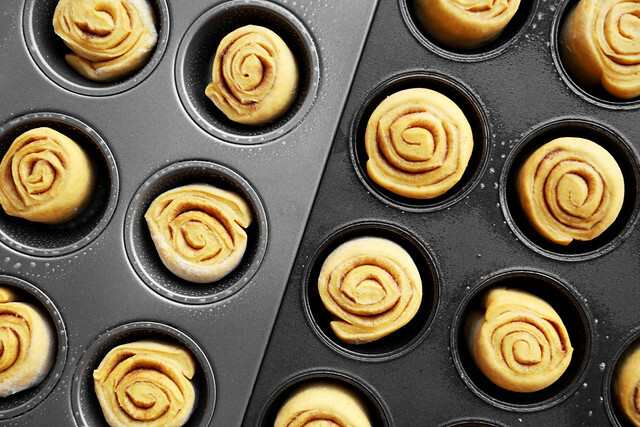 Make sure your oven racks are spaced far enough apart because the sugar buns tend to rise high during baking. Remove from oven and allow to cool completely on wire racks. Meanwhile, make the coating by mixing together the sugar and cinnamon. 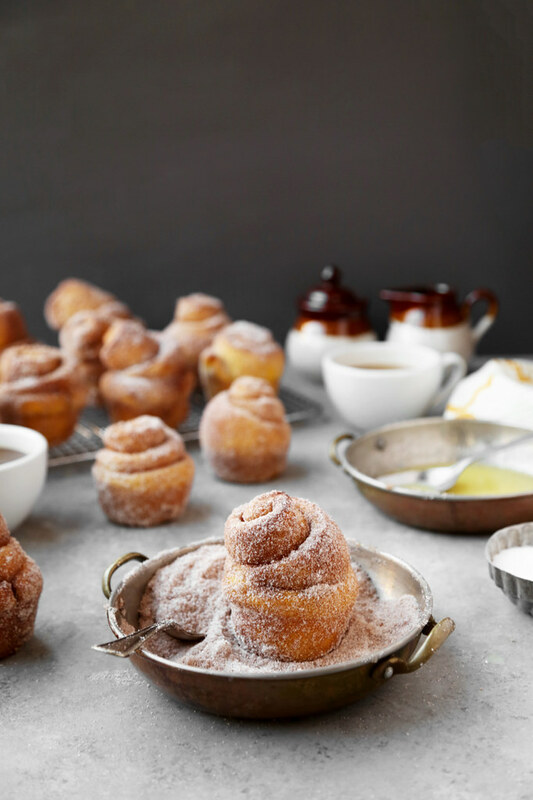 Brush or dip the cooled buns in melted butter and then roll around in cinnamon sugar. Serve immediately or cover tightly with plastic wrap. Will keep at room temperature for up to 2 days. You can also, freeze the baked buns and then thaw and roll around in butter and sugar when you're ready to serve and eat. I have missed you Jonathan. You not only bring a huge smile to my face but you always bring delicious tasting goodies to try!! You are right — I don’t think much about breakfast Thanksgiving morning but Christmas morning I like to prepare a Smoked Salmon Casserole ready to pop in the oven that morning. These rolls would be good along with the casserole 🙂 Can’t wait to hear your good news but shame on you! You are such a tease. Looking forward to the next post. That Smoked Salmon Casserole sounds delicious Marisa! The perfect Christmas morning meal! These are stunning! Never thought I would say that about a breakfast food 😉 Can’t wait to try them. Very happy to see you back indeed! And I can’t wait to hear all about this project once you’re allowed to dish. 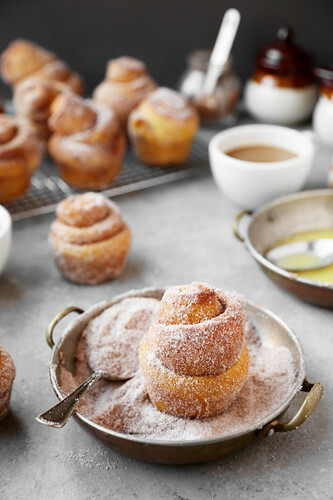 For now, I’ll take these buns…like, ten of them, and then go sit at the table and eat quietly. I am in love. I can’t wait to share it! Hopefully soon, but these buns are definitely worth the wait. Jonathan, wonderful recipe… Tell me, will I kill it if I use splenda instead of sugar? I am a diabetic and really have to watch my sugars. I’ve never used splenda before, so I don’t know what the texture of it is…I’m sure it will be fine, if it’s made for a sugar substitute. I can’t wait to see what your project is!! Very excited 🙂 And I love these buns, they look a thousand times better than regular ol’ cinnamon buns if only because of the cinnamon-sugar coating. WOW. I can’t wait to share it! Hopefully it’s sometime very very soon! Hello! I just made these and I am re-reading the recipe and I noticed that you have eggs listed, but they are not in the instructions. I made my batch without the eggs and they seems fine. I hope that it is ok that I left them out. These come together nicely. Thanks for sharing! These look amazing. My sister is getting married in October, and I am thinking these would be a great wedding day breakfast/brunch item – perfect time of year! 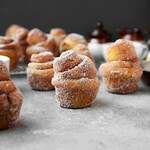 I found your site through Joy the Baker, and your photography is incredible. I’ll definitely be back! Just made these and they are amazing! I would prefer the pumpkin flavor to be a little stronger but that’s just my taste. They took longer than 3 hours to make but they were totally worth it and they got eaten up quickly! Just made these today. What attracted me to make them was the heigth. Mine did not have that beautiful swirling top. What did I do wrong? Still very yummy and fun to make!